Apple is going all the way to make its users happy after the launch of iPhone6 / iPhone6 Plus. 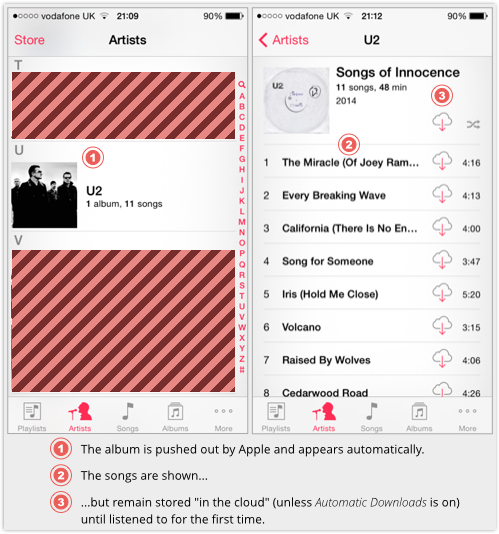 Apple has announced on Apple Day that it was releasing U2's latest album on iTunes, for free. Strictly speaking, you can't actually buy the album yet: it's on iTunes only. That nevertheless makes it the biggest album release in history, apparently. U2’s latest album is being brought to you by Apple by paying roughly $100 million in royalty fees and marketing expenses as per media reports. All this to make you, the Apple user happy!!! U2’s latest album, called Songs of Experience, has been fairly well received since its surprise release earlier this week. According to Metacritic, the album has received a score of 73 out of 100 from reviewers so far which is pretty decent. The Times‘ sources say that U2 frontman Bono said during negotiations with Apple that “first you would have to pay” for the album because “we’re not going in for the free music around here.” U2 manager Guy Oseary tells the Times that the new album was “a gift from Apple to their customers” as it was something that they bought and decided to give away. The only problem is that, you dont have much choice about this Album and it comes preloaded in your library. Apple has already published it to everyone who uses iTunes: it's not so much "free" as "compulsory." To be fair, the actual music files for the songs aren't fetched to your device, unless you have the non-default Automatic Downloads option turned on. But you automatically own the album, although the songs may show up with cloud icons to denote that you haven't actually listened to them yet. This has created some controversy for Apple, but if I were you I did enjoy the Album.